Can you see the value when there is no price tag? 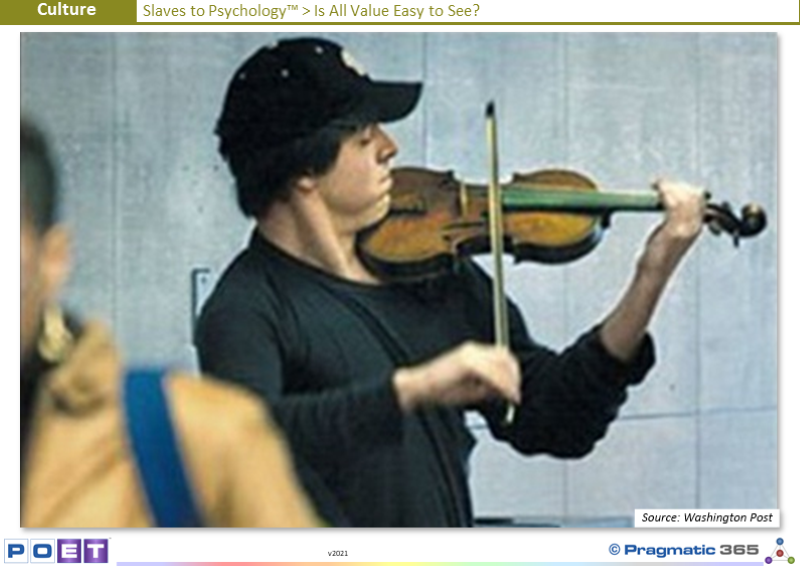 In 2007 world famous violinist Joshua Bell posed as a street musician in a Washington D.C. metro station to see how many people would stop and listen. Despite the fact that he was playing a $3.5 million handcrafted violin and had just sold out a concert in Boston where ticket prices averaged $100 each, very few people stopped to appreciate his beautiful performance. He made a measly $32 that day. Sometimes the value of something is not seen until you see it in the right context. Seeing the value in something is not necessarily as easy as “If I spend $1,000 today I will make $10,000 tomorrow”. Sometimes the most valuable things crop up in unexpected places and at unexpected times. Sometimes the most important and valuable things are not dressed in $2,000 suits from Saville Row. We need to be more open to spending the time to see the value in things that we may currently think have no value at all. Do people in your Enterprise know “the cost of everything and value of nothing”? Do people in your Enterprise only see obvious value and miss hidden value? Can you think of examples where this has happened in the past? Who were they? What was the impact? Why do you think they acted in this way? What needs to change to reduce the likelihood of it happening in the future? Who needs to drive that change?